Tis said there is only one view of Sydney, a vista that encompasses the Harbour, the harbour’s old coat hanger of a bridge and the Opera House. Of course they are much-loved and instantly identifiable everywhere, even if our Prime Minister is not so much. Melbourne, meanwhile, has no single view. No one image sums up Melbourne in the same way as Sydney. And that’s how I like it. Flinders St from the Cathedral. Last Sunday, I was in the CBD. 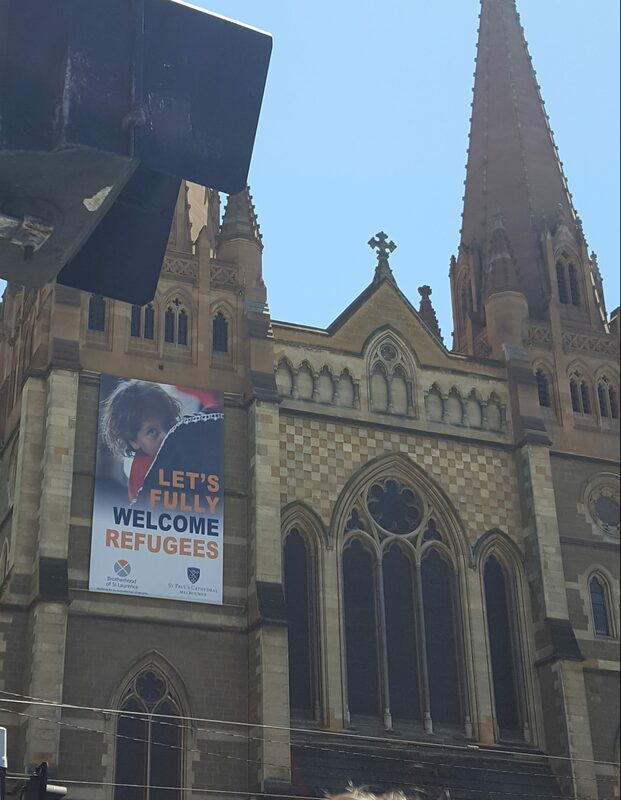 On the corner of Flinders Street, opposite its station, you can see St Paul’s Cathedral, and across the street from it, a the pub, both plastered with billboards that are for the latest NGV exhibition, and the newest musical (Book of Mormons) and with the church, one welcoming refugees. Diagonally opposite the pub, dinky old (classic) Porsche cars are displayed by an owners club at Federation Square. 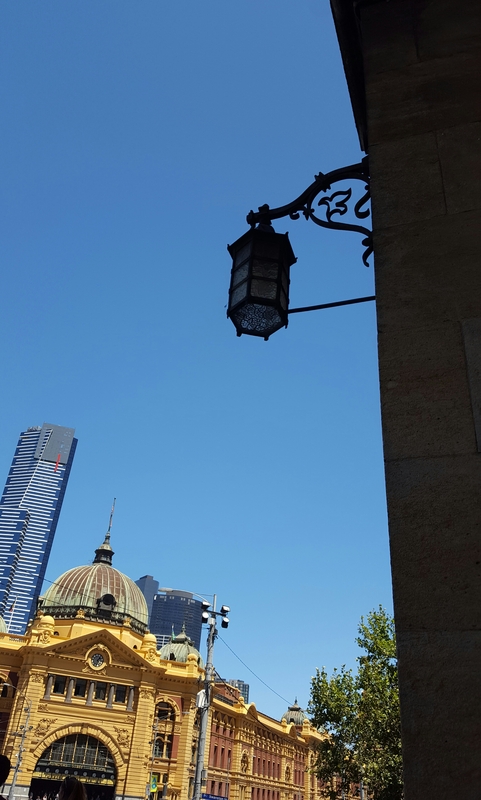 Further down the street, the Masonic building is nudging up to the lavishly ornate Moorish Revival Forum Theatre, which is opposite the angular and modern Ian Potter Gallery, currently displaying an exhibit on the architecture of a new mosque. I duck into the NGV and walk through the Joseph Brown collection. Originally Josef Braun, this artist, collector and art dealer came to Melbourne from Poland. 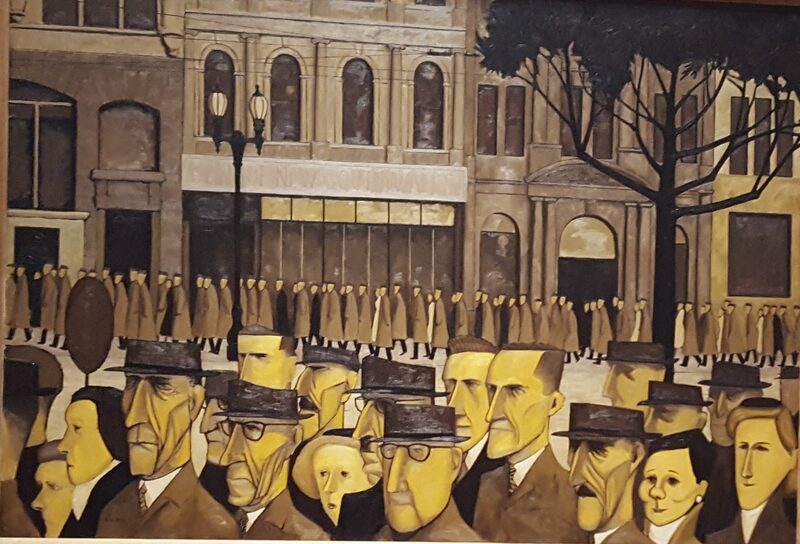 After serving in WWII, he returned and built his collection, sponsored artists, and, thus, like so many of Australia’s migrants, contributed to the rich life of his adopted city. 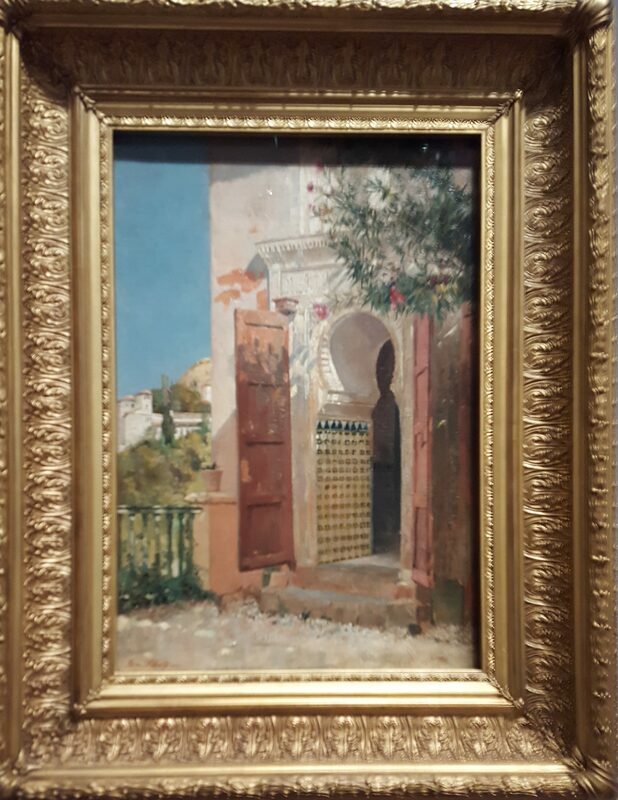 I notice, in the NGV’s display of his collection, are Australian artists and their work interpreting Scheherazade and a Sheikh’s return to Cairo from Mecca, among others. Because they could. Outside again, along the footpath, groups pose for photos. At the lights, Chinese girls dressed in red celebrating the Lunar New Year wait next to Sri Lankan retailers on their way to work. Mothers in saris and young women under parasols flow around me, like the Yarra nearby. 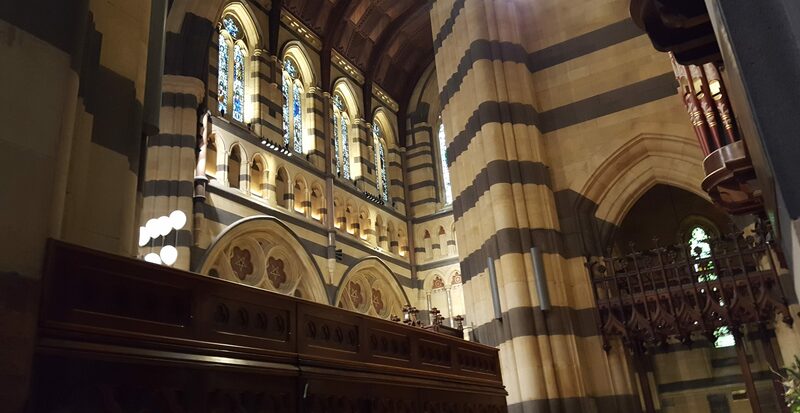 I enter, like many do, the cool hush of the Cathedral. I’ve never visited before. Beyond its massive columns and warm light, I am struck by the Vietnamese family, paused quietly in front of the Vietnamese War memorial plaque. Even now I am on the verge of tears thinking about this. One old version of Melbourne. Eventually, I wandered outside, a sleeping homeless man sheltering in a shady nook of the church. I head back towards my tram to sketch paintings Turkish ambassadors and anguished sheep. More than a week ago the city was scene of carnage and death, and courage too. A sixth person who could have been a neighbour, or someone in front of me in the supermarket, has died as a result of events on that day. I have no words for that. Melbourne’s oldest permanent bridge is a copy of Blackfriars Bridge in London. Plus trams. Most days, I suspect, are more like my Sunday morning, bustling and humming, trams dinging in the distance. This city reflects the diversity of its inhabitants in much of its architecture and cultural life. All around me locals and newcomers, tourists, citizens, and visitors, young and old, workers, and commuters, day-trippers and wanderers can enjoy this. All getting along, all going their own way, together. Because this is Melbourne. No single view sums up this city.